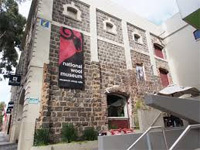 The National Wool Museum is housed in a historic blue-stone building. Opened in 1988, the Museum chronicles the history of Australia’s wool industry from it’s beginnings in the Geelong region from the 1830’s and regularly houses other temporary exhibitions. The Museum is fully accessible at street entry and there are ramps to every level. Accessible parking is located immediately in front of the Museum. Accessible toilets are located on each level.